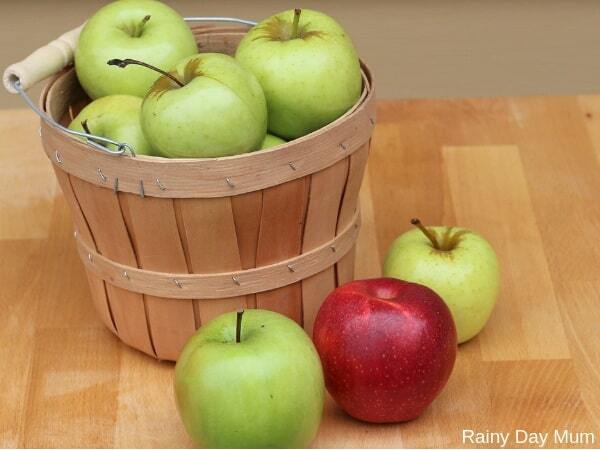 Autumn is apple season and it is a great time to try a simple apple science investigation. 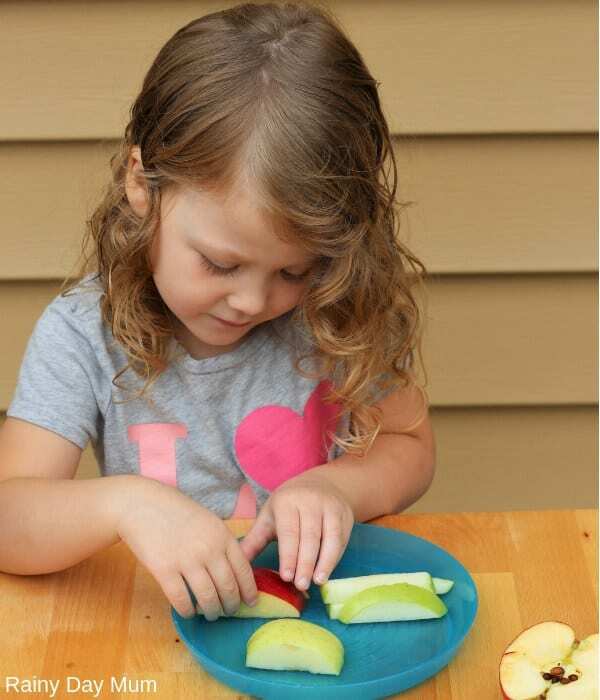 For preschoolers, it’s an ideal opportunity to practice making observations and use their 5 senses by having an apple taste test. 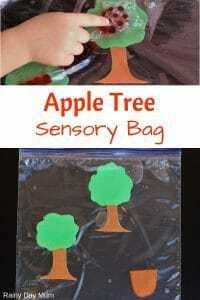 I have used this activity as part of an apple themed week and also used it whilst learning about the body and the 5 senses. We have included a data sheet for you and your preschooler to complete which is good practice for learning about Scientific Methods. 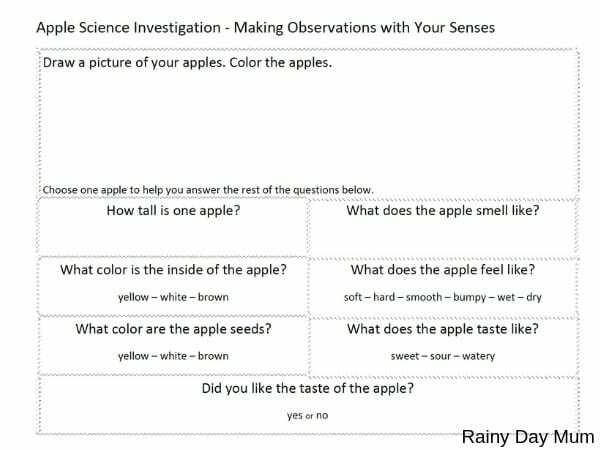 Download our Apple Science Investigation printable to help you record your observations. Selection of different apples – We used Granny Smith, Gala, and Golden Delicious for our investigation. 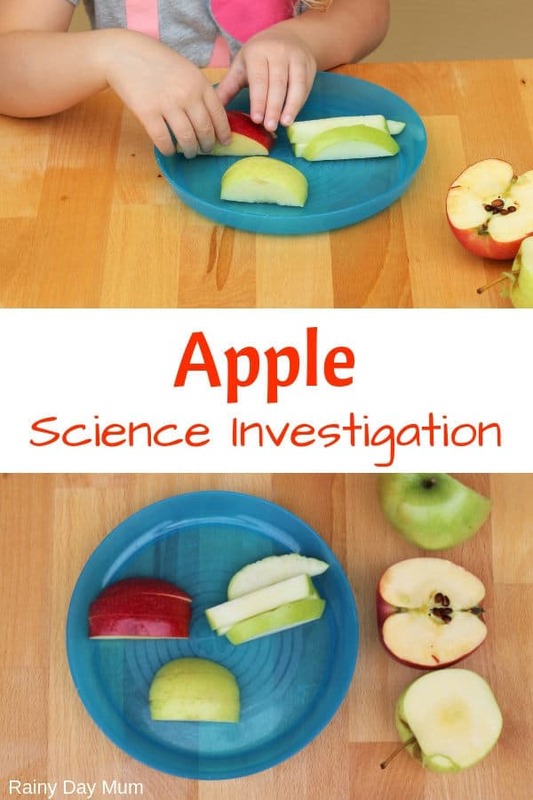 Start your apple science investigation by looking at the apples. Make observations using your sense of sight. Talk about the differences that you see. Are the apples the same size? What are their colors? Which kind of apples have you tasted before? Line up the apples by size. Which apple is the biggest? You can even measure your apples. 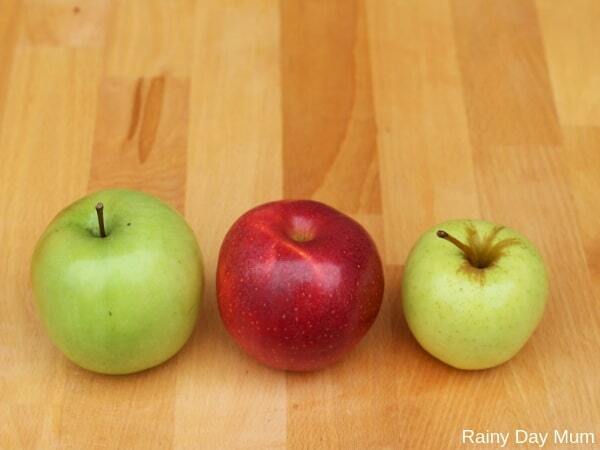 Use a ruler to measure the height of each apple. 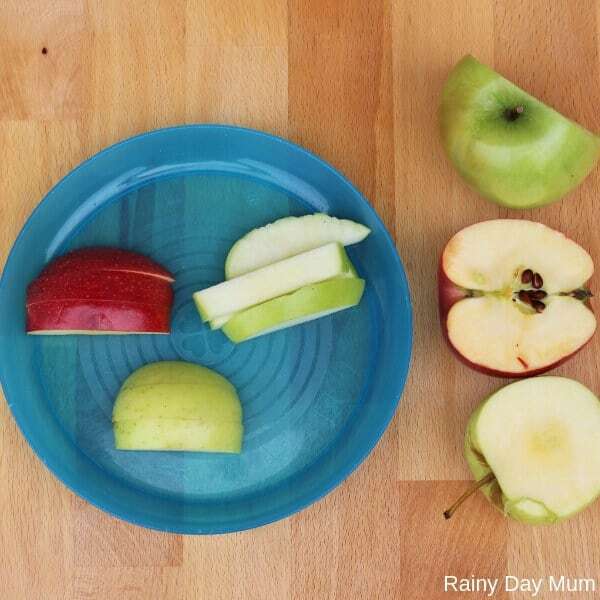 Use a string to help you measure the circumference of each apple. 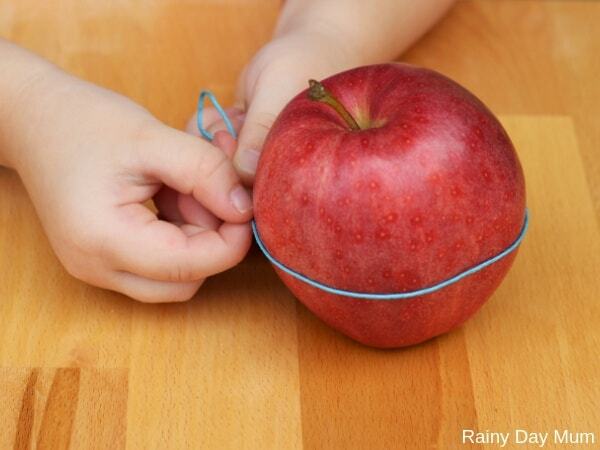 Wrap a piece of string around the widest part of the apple. Lay the string on the ruler to determine the measurement. After washing the apples, cut the apples into slices (most likely a job for a grown-up). Continue making observations. Discuss what the insides of the apples look like. Are there any difference between the apple slices? 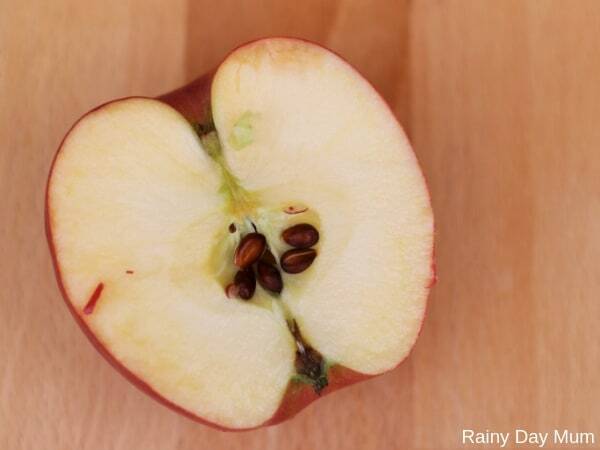 What color are the apple seeds? What do the apples smell like? Touch the apples. What do they feel like? It’s time to taste the apples. Do the apples taste sweet or sour? Are they crunchy or juicy? Which one is your favorite? 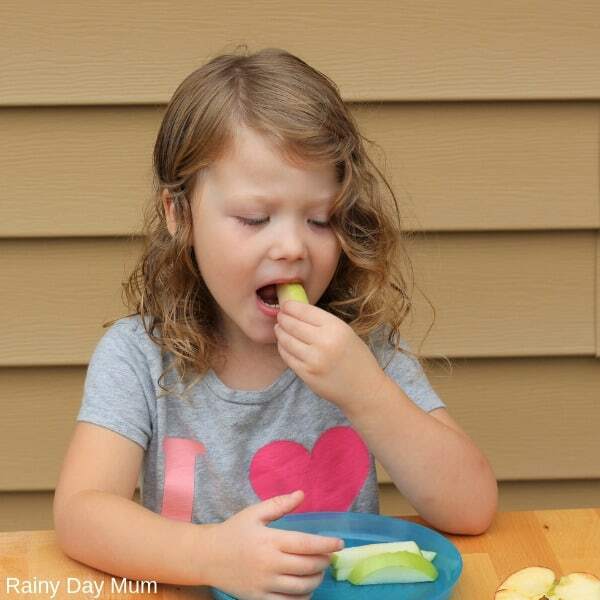 Encourage your child to record observations and draw pictures of the apples. 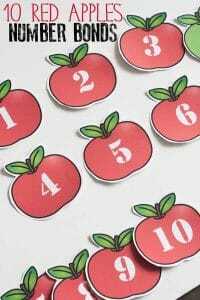 This apple science investigation is part of my A to Z Science for Toddlers and Preschoolers ebook. 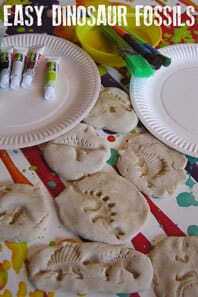 The introduction to science for ages 2 to 5 includes one science activity for each letter of the alphabet. 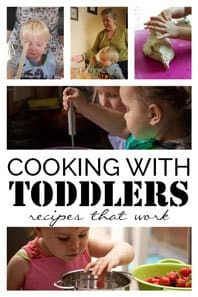 From apples to zoo, these experiments and explorations are sure to be a hit. Each of the 26 science ideas includes a materials list, instructions for the activity, questions to ask, and the science behind it. 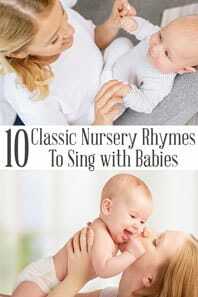 Variations and modifications for different ages are provided when possible. 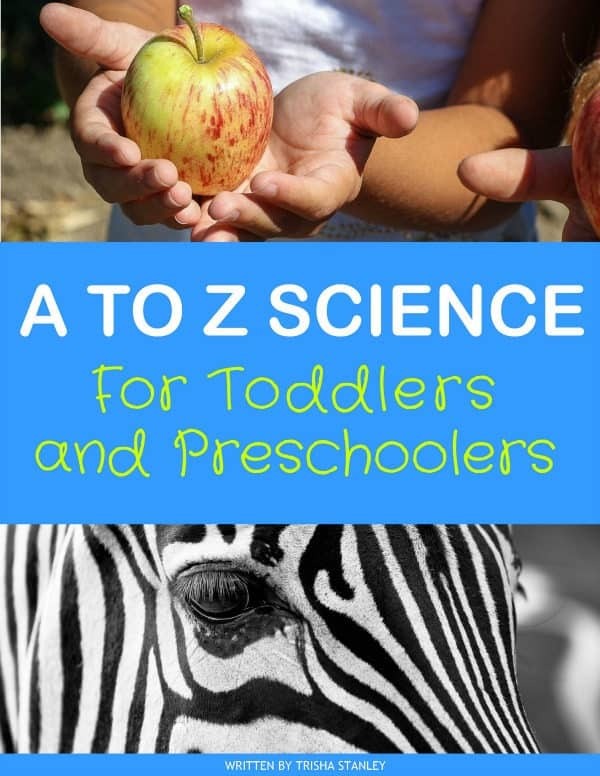 Buy the A to Z Science for Toddlers and Preschoolers ebook here. 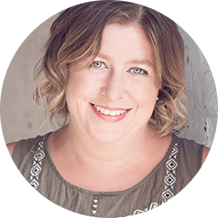 Check out this list of apple book suggestions and apple science activities to go along with them. 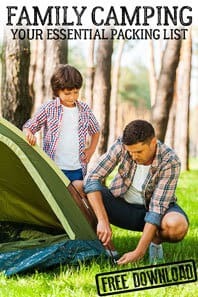 If you’re heading to an apple picking field trip with preschoolers, be sure to read this post for fun orchard educational field trip ideas. 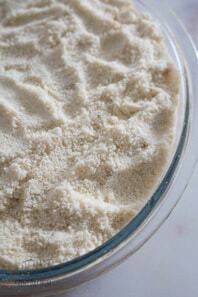 You’ll also want to try this 2 ingredient apple scented play dough recipe. 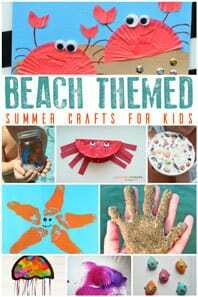 It’s perfect for working on fine motor skills. 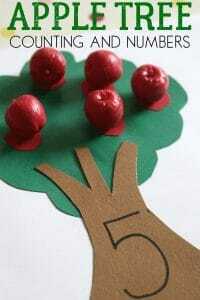 The post also includes ways to incorporate math skills into the play.